Portuguese Ravensire members’ nicknames may sound like a little tongue-in-cheeky jokes (Rick Thor, Nuno Mordred, Ze RockHard), but their music on The Cycle Never Ends is anything but. If you are longing for an epic burly heavy metal album with manly sweat practically emanating from every note you just found one. 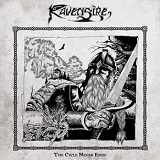 Ravensire know how to break into a catchy classic NWOBHM gallop (Cromlech Revelations, Trapped in Dreams), or how to come up with a fist pumping opening riff (Crosshaven). At the same time they are definitely enjoying the harmonies they have created (Trapped in Dreams) and indulge in laying into a juicy (Cromlech Revelations) or even meandering (Crosshaven) solo. But with Ravensire everything has to be muscle wound, be it the sped up Solitary Vagrant or the anthemic Crosshaven. The riff from the latter even reminded me of the recently reviewed (and praised) Visigoth, but Ravensire would definitely prevail in the arm wrestling competition with the Americans, as everything is certainly harsher and more inveterate with them, especially in a vocal department. Often I found myself thinking: guys, it is OK to show your more sensitive side, you have shown us more than just a flash of your might already. And, indeed, Ravensire find a way to enrich the palette, to expand on the theme without diluting the main message. The closing White Pillars trilogy is as epic as you will find it. Part 1 Eternal Sun can practically serve as a soundtrack for Conan the Barbarian. Producers of that movie would have definitely considered The Cycle Never Ends if it was released in the early 80s, in the times where the album actually belongs. Part 2, with its trebly vibrating guitar sound is a little more steeped and tragic, and reminded me of some of the Twisted Tower Dire works, minus the high vocals of Tony Taylor (RIP) or course. The most involved, in terms of composition anyway, must be the slower doomier Procession of the Dead, where distortion is turned up a notch, and penetrating melody just saws you up in half. The acoustic break and the evil voices unveil some occult mysteries of ancient Lusitania or some non-real fantasy place, until the proceedings speed up again and the leading melody makes a triumphant return. An early 2016 release, The Cycle Never Ends is something to seek for the fans of old Manowar circa Hail to England, Omen, Greek Battleroar, purer, before it became power metal oriented, Grand Magus or, if you are familiar with it, fellow countrymen Portuguese Ironsword. There is a pair of labels who know a gem in this genre when they hear one. Shadow Kingdom is incomparable, but Cruz Del Sur understand this realm of metal very well too, so you can fully trust their judgment to sign up Ravensire.